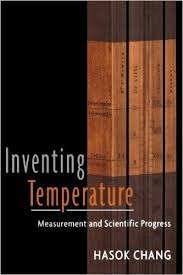 My next read is more academic in character, Inventing Temperature: Measurement and Scientific Progress by Hasok Chang. As an undergraduate chemical physics student, temperature was important to me. On the chemistry side of the equation, increasing the temperature of a reaction by 10 degrees doubles its rate. Statistical mechanics forms the core of chemical physics, and this is very much about temperature and equilibrium. In a laser, light is emitted when population inversion is achieved which some describe as negative temperature. It’s fair to say that measuring temperature is one of the core activities of any physical scientist, even if all you are trying to do is keep your experiment at a fixed temperature. The book starts with a discussion of the fixed points used in thermometry. For the familiar Celsius temperature scale these are (crudely) the melting point of ice and the boiling point of water. The temperature difference between these two fixed points is divided into 100 equal divisions, and the scale can be extrapolated above and below these fixed points. But this isn’t so easy, it isn’t necessarily a given that ice always melts and water always boils at the same temperature – superheating and supercooling are things that will dog you, particularly if you take great care with your experiments! In a theoretical sense we now know that melting and boiling happen at fixed temperatures under fixed conditions. Experimentally exactly how you set your water boiling and your ice melting can change the temperature at which they appear to melt or boil. In the early days of temperature measurement these questions were all consuming and took many years to resolve. Another question is “what does it mean to measure temperature"?”. Chang proposes a Principle of respect in the development of measurement and also epistemic iteration. That is to say that the development of the measurement of temperature is guided – respects – our perception of temperature but is not dominated by it. Sometimes our perception of temperature is wrong, epistemic iteration allows us to correct that perception or at least make our measurement correct. If you’d like an example of an incorrect temperature perception try testing the same water having run your hand under hot and cold taps – we perceive a different temperature even when there is no difference. The next step in the process of measuring temperature is trying to make a linear scale which does not depend on the precise nature of the thermometer you use. This is difficult to achieve without having a clear idea of what temperature is. Linked to this is the problem of what the best “working fluid” is for your thermometer – although we are familiar with mercury and alcohol thermometers, from a scientific point of view “air thermometers” are the best behaved. To a 20th century physicist this is unsurprising but in the late 18th and early 19th century this was not obvious. Furthermore, air was more difficult to work with. After considering the problem of the linearity of the temperature scale Chang turns to temperatures far above and below the fixed points of the scale, below where mercury freezes and above where glass melts. The challenge at low temperatures was attaining low temperatures, the challenge at high temperatures was finding any sort of device that could survive and keep working at high temperatures. For a long time a pyrometer invented by Josiah Wedgewood was used which relied on measuring the shrinkage of clay pellets as a measure of temperature. Joining this temperature scale to one measured at lower temperatures with conventional thermometers was hard. Finishing the specific sections on measuring temperature is a chapter on theoretical considerations, focusing on the work of Joule and Thomson. Who established an absolute temperature scale, and under what circumstances a gas could be used to measure such a scale. Epistemic iteration plays a part here as the combatants need to find a concrete system to demonstrate an abstract principle, and show that their concrete system is close to being abstract! The book ends with two chapters on more general matters in the history and philosophy of science. The first of these is on Chang’s view of how science progresses. The second is on what Chang calls “complementary science”, how the history and philosophy of science could lead to an increase in scientific knowledge. In my view scientific progress would likely be improved if students were taught better in the history of their subject. 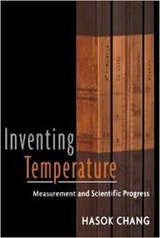 I found this book fascinating, as far as I can recall I came across a much abbreviated form of some of this work during my A-levels when I wasn’t really able to appreciate the scale of the challenge in the now simple act of measuring temperature. Once at university measuring temperature was a given but I gained a more sophisticated understanding of what temperature meant – an understanding that was based on theories developed in the late 19th century.